A longtime and good friend, Carrie Marsh, died recently – October 23, 2005. 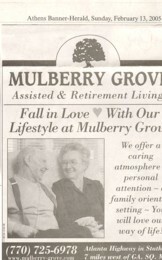 Carrie had a lot of health problems in recent years and at the time of her death was living in Mulberry Grove Assisted Living Home in Statham. (An excellent facility, in my opinion). I knew Marsh as the Health Nurse in the 50’s and 60’s. I came to know her as a “next door” neighbor on Court Street in Watkinsville when I opened my law office next door to the County Health Department. I would see Marsh daily and we also attended some of the “courthouse” coffee breaks, birthday celebrations and “watermelon cuttings”. Marsh had a frankness and sense of humor that I liked. We could tell each other that the “other was not perfect” and remain friends. Marsh had a strong presence around Oconee County for many years. It would be fitting and appropriate that the Oconee County Heath Department be named the “Carrie W. Marsh Health Facilty”. It is well deserved! Carrie W. Marsh was born in Saluda, SC to Hugh and Cora Lake Wheeler on Sept 3, 1921. 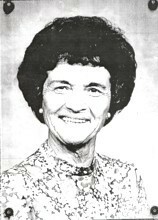 Most of Carrie's life, however, was spent in Oconee County where she worked as the Oconee County Public Health Nurse from 1953 to 1983. Due to these 30 years of service to Oconee C6unty, many Oconee residents considered her an "Oconeean". The Health Department where Carrie worked was adjacent to the Courthouse in Watkinsville. There Carrie interacted with many county officials and local businesses. Carrie was part of the "courthouse crowd" and she and the others were proud of it. She was a regular in the "Mr. Robert" (Nicholson) coffee breaks at Jim Booths Sundries on the opposite end of the courthouse. Many Oconee County children remembered her as the "Shot Lady”. Older citizens also went to the Health Center for flu, insulin and other shots. 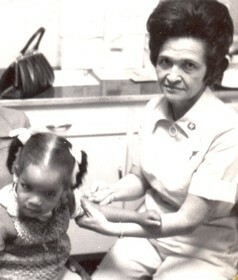 Carrie was a regular at the public schools in Oconee County where the kids would often line up to receive their shots. She appears, along with her secretary, Naomi Hinsley, in the 1955 Annual of Carrithers Grammar School. "Marsh" and "Miss Nurse", as her close friends often called her, was an outgoing person who loved people. She could tell a joke as well as laugh at one in a mini-second. She was heard frequently indulging a loud and happy laugh. When Carrie retired from the Health Department, she worked part­-time for Action, Inc. for about 15 years. Her office was in the Old Jail behind the courthouse. She administered the food program and assistance for heating for the elderly and indigent. During this time, she became friends with a newer generation of "Courthouse Workers". In the mid-nineties, Carrie worked at the DFCS office on Greensboro Highway until health issues caused her to discontinue working in 2001. For Carrie, life without work was difficult for her. So much of who she was revolved around her work as a nurse. It was in these last few years of Carrie's life that I met her. Whenever she came to the hospital, we would visit. During our visits, she often spoke about what God's plan for her was now that she was slowly losing her independence and could no longer work. We often prayed about this and it wasn't until after she died that I heard how God had answered her prayers. Initially, like many people, Carrie dreaded the idea of moving to an Assisted Living facility. But it was in such a facility in Statham, at Mulberry Grove, that Carrie found something, or someone to live for. I have not met Buck Bell, but it sounds as if he provided for her, as she provided for him, a love found late, but nonetheless healing for her. As described by those who observed them over the past. couple of years, they were a couple of "love-birds”. Through Buck, Carrie found why God had kept her around. Those who worked at Mulberry Grove spoke of a seat where Carrie always sat and that all the other residents knew to be hers. Today that seat is empty, and because of that, we mourn. But we also give thanks, for the time that we did have with Carrie and for her life of service. Today, our prayers are with her son, Charles, and with her daughter-in-law, Elaine. Our prayers are also with her sister, Aida Ray Carruth, and her brother, Richard Wheeler. Finally, our prayers are with Buck and with her many devoted and dear friends. May God grant her peace. AMEN.